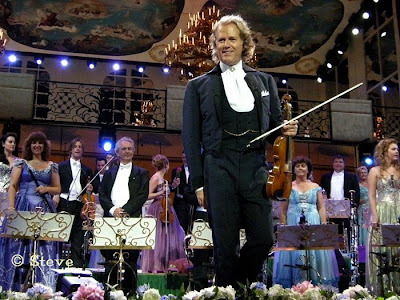 Number One André Rieu Site For English Speaking Fans Around The World! With The Latest News - Photos - English Translations and More! And For All Those Video Interviews With English Subtitles ! 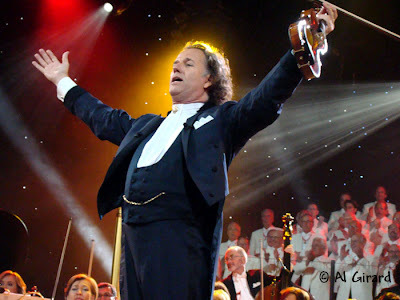 André Rieu FOUR Times on The Vrijthof in Maastricht! First Three Concerts SOLD OUT. Fourth Concert tickets ON SALE now! This year he celebrated his thirtieth year as an artist, as well as a large concert tour in Australia. There are few countries in this world where he and his orchestra have not performed, but André Rieu remains a pure bred Maastricht citizen. Just like in previous years, he will once again appear on the Vrijthof of his beloved city this coming July. Three concerts were originally planned, on the 10th, 11th and 12th of July, but because of the high demand for concert tickets, there will be a fourth concert this coming year on Monday July 13th. Thanks to John for the Translation! 0 Comments ~ write your Comment here! Artificial snow and figure skaters in the Gelredome. 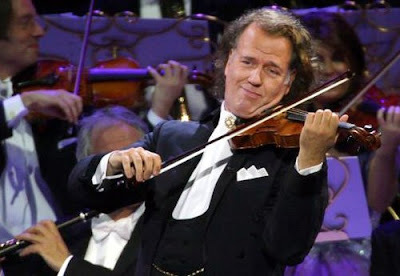 André Rieu and his Johann Strauss Orchestra had Two Sold Out Concerts, Friday and Saturday in the Gelredome Stadium in Arnhem. So close to Christmas the violinist had Reverand thoughts, "If I were to be Prime Minister, I'd issue every soldier a violin." Although he entered the hall filled with 22,000 attendees from the rear and under loud marching music, he and his Johann Strauss Orchestra quickly had the audience in the Christmas spirit. Almost every one hummed, or sang along to "Silent Night", either in Dutch or German. The Gelredome is just barely across the border for our easterly neighbors. The mood quickly escalated when a large portion of the audience received an avalanche of artificial snow. This time again, Rieu pulled out all the stops. Singers and vocalist, the trumpet corps "Edelweiss", two ice rinks on which the Viennese ice dancing ensemble "Les Patineurs" swirled around, and even the entire Maastricher Staar entering with burning torches in each member's hand. 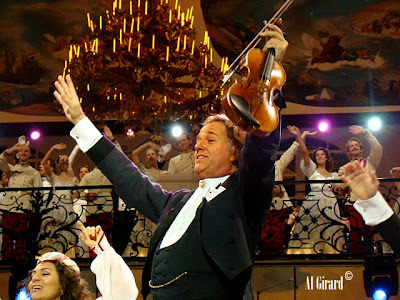 During the concert, Rieu took time out to play a tribute to the memory of Luciano Pavarotti. Amongst others, his signature song "Nesum Dorma" was presented. Rieu has just recently returned from an immensely successful tour in Australia, where one of the papers called him the "Liberace of the Violin". By Barenda Grutterink ~ Thank You for the translation John! Arnhem A crowded Gelredome was transformed into a full Christmas atmosphere. 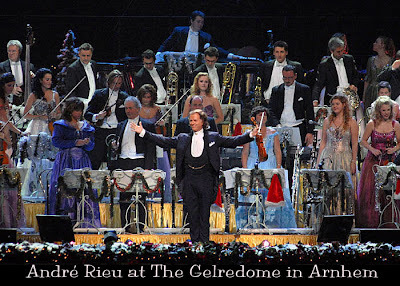 André Rieu was responsible for it all as he performed twice this weekend in the Arnhem Stadium. André Rieu filled the Gelredome with a Christmas gala concert and as always, the Limburg orchestra leader presented a great show making it a fun celebration. In addition to his Johann Strauss Orchestra, the violinist included 28 ice dancing couples brought over from Vienna, as well as the Mastreechter Staar, three tenors and a soprano. But, before he played a single note Friday evening in the Gelredome, Rieu received two gold awards for the sale of two older concert recordings: Live in Maastricht II and Live in Australia. The latest DVD has only been on sale for a week and already has sold more than 30,000 copies. No DVD recordings will be made of the Christmas concerts in the Gelredome in Arnhem on Friday or Saturday evening. More than likely though, Rieu will return to Arnhem next year. It has to become a tradition. Thank you for the Translation John! 1 Comments ~ write your Comment here! 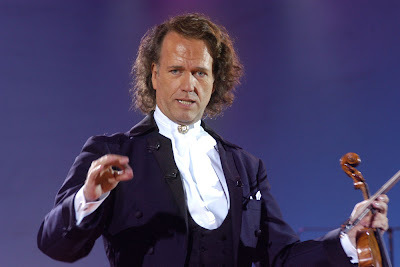 Pink may have sold 400,000 tickets and Kings Of Leon might have the biggest selling album of the year but the biggest selling artist of 2008 in Australia was Andre Rieu. The maestro picked up an incredible 100 Platinum Awards for sales from the past year in Australia. Universal Music states that Rieu’s catalogue has sold in excess of 2 million units in Australia this year. His ‘Live In Australia’ DVD, released just over a week ago, came in as the fastest selling DVD ever in Australia. It was the second DVD ever to sell more than the number one album. ‘Live In Australia’ alone has been awarded 20 platinum awards. His ‘Waltzing Matilda’ album went past the 70,000 unit mark last week earning him his 100th platinum award. Rieu will return to Australia for more shows in October 2009. Dear fans, this message is especially for our Dutch fans. Our concert tickets are sold through multiple outlets. However, many outlets have extortionate prices. Therefore we would like to advise you to always check our web site for trusted sales. 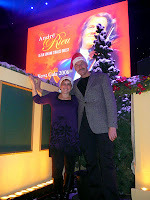 Best regards, Production team, André Rieu ~ Thanks for the Translation John! 2 Comments ~ write your Comment here! 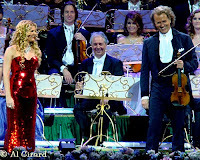 Violinist, conductor and showman André Rieu achieved two major milestones this week. First, Billboard Magazine announced Rieu as the number one Top Selling Classical Artist of 2008 in the USA. Second, of all Rieu's newest DVD 'Live in Australia' set unprecedented sales records and outsold Pink. 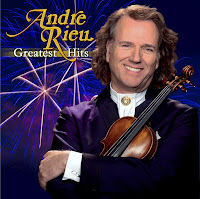 The leading music industry magazine Billboard announced André Rieu as the Top Classical Artist in their 2008 Year End chart. Rieu, known for bringing Classical Music to the mass, also celebrated three albums in the Billboard's 2008 Top Classical Albums chart. In Australia it seems like the Andre madness has no limits. Rieu's latest release "Live in Australia", which was recorded in Melbourne on November 15th, sold more copies than the newest albums of Pink and AC/DC. The success of "Live in Australia" triggered another great moment in Rieu's career. He now has 100x platinum records in Australia. The most remarkable fact is that this exceptional number of records was mainly sold in the last 18 months. Says Rieu: "I am very happy with all this positive news. It is fantastic to be number one on Billboard's list. And who had ever imagined that a classical music DVD would beat some of the most popular rockers in the charts? I want to thank my fans for their loyalty and I am looking forward to playing for them again in Australia and in the USA next year". 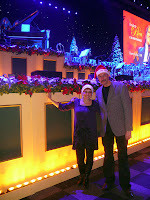 SOPRANO Mirusia Louwerse has already had her Christmas celebration. She and her family, who live in Birkdale, enjoyed the usual festive fare on December 12 on the eve of her return to Holland as part of violin virtuoso André Rieu's performing family. In true Dutch tradition, she also celebrated Sinter Klaas on December 5, a double celebration of Christmas and the success of two shows at Suncorp Stadium. The performances were extra special for Mirusia as the first in the André Rieu cast "back home". "I have never been so happy during a tour. 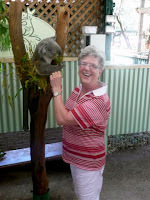 Performing back home in Australia completed the circle for me," she said. In the audience were a smattering of Queensland Conservatorium and school friends as well as family and residents from the Prins Willem Dutch village at Birkdale, with whom Mirusia maintains a close association. "We performed first in Melbourne, Adelaide, Perth and Sydney so this gave my butterflies a chance to settle before coming home," Mirusia said. "It is nice to perform in front of people who give you their absolute support. I wasn't nervous, just excited. "It was a privilege to perform as a way of saying thankyou for the support. It really means a lot. "I have tried to catch up with as many as I can while I am home," she said. 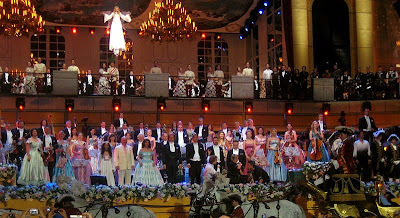 Mirusia returns to perform with the cast in the Jose Carreras Gala Concert in Leipzig, Germany, with tours planned in 2009 in Japan, America, Germany and Italy. She will return to Australia for a concert with André Reiu in October. "I may have wanted to perform at home, but it has also been Andre's lifelong dream to perform here. He wanted to perform in the furthest place he could and he has discovered that by doing this, it has not been difficult at all. He will be back," she said. Mirusia said Andre had "lots of surprises up his sleeve" for the show. André Rieu Billboard's #1 Classical Artist of The Year! December 16, 2008 ~ I thought we were going to have to wait until Friday to know this, but I just now got a letter from Denon ~ here is the part he wrote about it: They are VERY excited for André!! "I just heard that it is official - André is the #1 Classical Artist in America according to Billboard!!! So you can make a nice big announcement if you like." And A BIG Announcement We Are Making!!!! Billboards #1 Classical Artist in America for 2008!!" ►Go To Denon and Read About it All!! 4 Comments ~ write your Comment here! ANDRE Rieu continues to break records, with the Dutch violinist's Live in Australia DVD becoming the fastest selling in Australian history. Live in Australia was filmed at Telstra Dome on November 15. The DVD sold 50,452 copies in just four days last week, with music stores struggling to cope with demand. ► Review: Andre Rieu's DVD takes kitsch to a whole new level In comparison, this week's No. 1 CD, Pink's Funhouse, sold 36,529 copies. And the No. 2 music DVD, Pink's Live from Wembley Arena, sold just 2537 copies. This week Rieu has six titles in the list of Top 10 music DVDs. Live in Australia has instantly achieved 10 times platinum status, in recognition of more than 120,000 copies sent to stores. 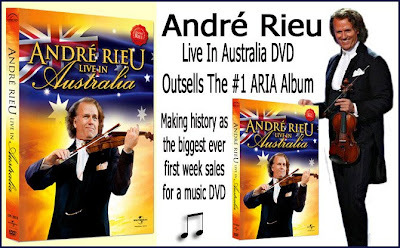 The pre-Christmas rush now brings Rieu's Australian combined DVD and CD sales to more than two million in less than 18 months. "It's the power of heart-warming music by great composers," Rieu said of his latest DVD chart-topper. "It's a love affair: I love my Australian fans and they love me. Australia is my second home and it will always be." 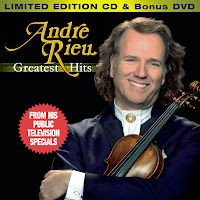 André Rieu's Greatest Hits DVD Has March Release Date! I Got a Letter From Denon With Some *Exciting News This Weekend! *He also told me that there's a chance André can make Billboard as the #1 Classical Artist of The Year in the US. They are keeping their fingers crossed and will know on Friday ... so let's keep our fingers crossed too everyone!! He sent me HUGE copies of the covers, but I had to make them smaller to post on here ... I put them on as large as I could for you without making the file size too big. Making history as the biggest ever first week scans for a music DVD and the first classical music DVD release ever to scan more units than the #1 ARIA album in one week. Following the success of his recent national stadium tour, the phenomenon that is André Rieu turns another page in the book of firsts. His tribute to his Australian fans, the 14 X Platinum DVD Live In Australia, filmed in Melbourne on November 15, has become the biggest ever first week scans for a music DVD and the first classical music DVD release to scan more units than the #1 ARIA album in one week. What makes this an even more astonishing accomplishment is that ANDRÉ RIEU Live In Australia DVD achieved it with only four days at retail. Unprecedented, last week André Rieu’s total music DVD scans accounted for 70% of the total top 40 music DVD scans and sales of his CDs and DVDs have now crossed the 2 million unit mark, the majority of these achieved in a record space of 18 months. 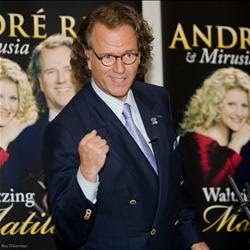 Upon receiving the news of the extraordinary debut chart success of his DVD, André Rieu commented, "It's the power of heart-warming music by great composers. It's a love-affair: I love my Australian fans, and they love me. Australia is my second home and it will always be!" "André Rieu is a phenomenon, not only in regards to the sales rate but the fact that he has dragged a completely new audience back into our stores who repeatedly purchase everything he releases" – Gavin Ward, General Manager, Leading Edge Music. André Rieu will return to Australia in October/November 2009 for a series of arena shows with a new program which promises to be as fun-filled and energising as his recent Romantic Vienna Night tour. Thanks to Jann for sending this to us from Universal Music Australia! Andre Rieu's 'Live In Australia' DVD Outsells Pink! First it was Aussie stadium operators. Now it's the turn of Aussie retailers to enjoy some pre-Christmas cheer from Dutch violinist Andre Rieu.Universal Music Australia is boasting record-busting first week scans for a music DVD, after the classical showman's two-disc release "Live In Australia" landed at the top of the national DVD chart, published Sunday. Official Schedule and Details of André Rieu's All Access Pckg. 3½ hours before the concert: You are welcomed at the venue with a cup of coffee, coat check is available. VIP parking is available at selected venues. 3 hours before the concert: You will attend the soundcheck. See how dedicated André is to create the right sound and experience. You see the whole JSO and all the soloists at work, but in a unique and totally different way! 2½ hrs before the concert: Dinner time! A three course gourmet dinner in a dedicated dining room at the venue or a restaurant nearby. 1 hr before the concert: Time to head to the concert hall. Start of the concert: Enjoy! Don’t forget to waltz in the aisle. 10 minutes after the concert: A representative from André Rieu will meet you and take you to the Afterparty (food and drinks included). Mingle with the musicians and soloists and of course the Maestro himself. You’ll have your photo taken with André and autographed. Before you go you will receive a special gift. 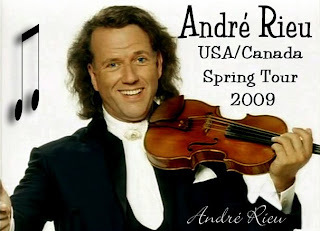 André Rieu's Spring USA/Canada Tour ALL Access! André's NEW Additions To His All Access VIP Ticket! ►As we posted for you a few days ago, André has a new exclusive addition to his "All Access Package", and he officially sent it out in his News Letter today. Sound Check and Dinner will be added to the ticket ~They have never done this before! For those of you that don't get the Newsletter, here is the part about the New Addition to the All Access tickets for the USA and Canada 2009 Spring Tour and they will be available to ALL cities on the Tour, not just the original few. André All Access ~ Your Once In a Lifetime Experience! Count on our 2009 tour in the USA and Canada being even more unforgettable than the last. The Johann Strauss Orchestra and I are so excited to be back in the US, performing for you again. But that's not all! 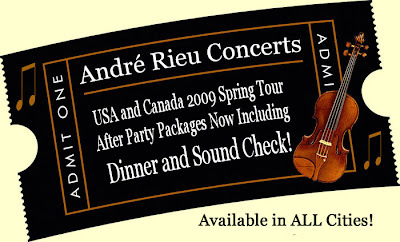 I'm thrilled to also offer the exclusive André All Access package. Before the show, you'll be admitted to the sound check for a preview of the evening's entertainment, and then you'll enjoy a gourmet meal in a first-class dining room. After the show, you will be whisked backstage where you can mingle with the musicians and soloists at the after-party. You and I will have our picture taken together. We'll raise a glass, and to commemorate the magical evening, I have a special gift already waiting for you! "The special thing about my North American fans is that they show their enthusiasm right from the first note, you don't see that anywhere else. Together we create a great atmosphere and that's why I keep coming back." Click on the link below to read ALL the Billboard Press Release. Attention ~ Exciting News For The Spring USA/Canada Tour!! We have just received this letter from The Offices of André Rieu USA and have been asked to pass it on to all the fans! There are some exciting NEW additions to the All Access VIP Tickets!! Monday December 8, 2008 ~ We wanted to let you know that this Wednesday almost all concerts for the USA/Canada tour 2009 will start with their pre-sale. Most of them have really good seats available and we also offer the exclusive After Party Package that we offered in Australia . ►We made it even better, because it includes The Soundcheck (something that we have never done before) and a Dinner. This will become available in ALL cities (and can also be purchased without a ticket for people who bought their ticket through PBS). A lot of us have seen what's been happening on The Vrijthof through the live Webcam ... Here is what it is. 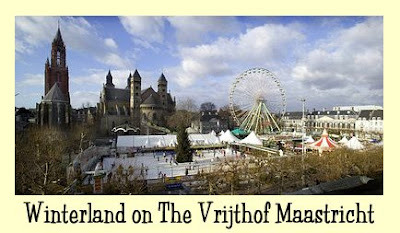 The anual Winterland on the Vrijthof has a huge ice rink, a fairground, theatre productions, live music and a Christmas market. Mulled wine, hot chocolate and pancakes in the square top off a magical family experience. G'day mates, how are ya? We are still traveling around in our campervan, somewhere between Sydney and Melbourne. We are having a great time in the Land of Oz. 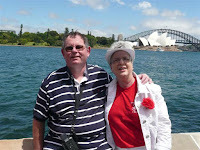 We spent a few wonderful days at Vilma's and Tony's place in Sydney. They showed us Sydney and surroundings. 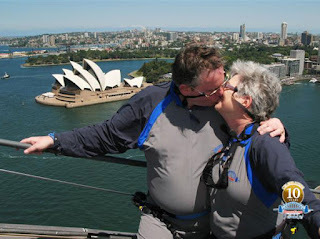 We climbed the famous Harbor Bridge. 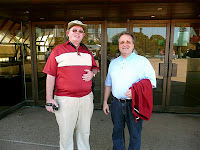 We met Thomas (one of the tenors) near the Opera House. We attended Margaret's fan picnic in the Royal Botanical Gardens, where we met a lot of new fan friends. We attended two wonderful rainy concerts in the ANZ stadium, with an additional lightshow outside. We ate fish and chips on Manly Beach. I ordered dead horse on my chips (George, thank you for your Australian slang dictionary). We spotted dolphins at Palm Beach and we were on Botany Bay, too-rall, li-oo-rall, li-ad-di-ty. Vilma and Tony, we want to thank you from the bottom of our hearts for your hospitality and friendship! Aussies, I'll tell you a secret! I like vegemite! Vilma gave me a small jar to take home. 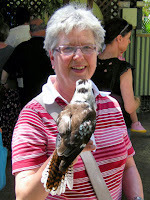 We also want to thank count Steve for a most enjoyable afternoon at Featherdales Wildlife Park. 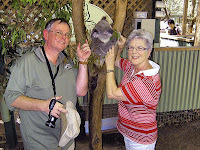 We cuddled wallabies, koalas and a wombat. Not the Tasmanian devil, he looked too devilish and we did not want to miss a few fingers. We tried Steve's Hungarian Palinka, which is not bad at all! Next we went into the Blue Mountains. We did the scenic railway, cableway and flyway and we were knackered from the Furber Steps and a lot of bushwalking to see three ugly sisters. 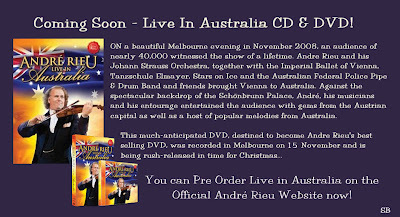 André Rieu Live in Australia CD and DVD for Christmas! From Lyn and Darcy ~ If there are only two things André remembers about Brisbane, they would have to be the enthusiastic audiences and the storms. Fortunately, Thursday’s storm struck at about 4.15pm and was all but over by 5pm when the gates to Suncorp Stadium opened but left a legacy of wet chairs and pools of water on the plastic arena flooring. Stadium staff had a mammoth task drying off the chairs on the field before concert goers arrived. We in the grandstands were left to dry our own seats but with ready supplies of paper towels available. 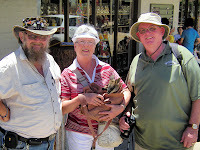 Darcy and I had pre-arranged to meet Helen, Marianne and Barbara at the right-hand fountain for photos and catching up. Just after Helen left to go back to her family in the grandstand, we saw Friendship Group member, Gwenda and her husband Keith and a couple of their friends, one of whom had known Darcy more years ago than he cares to remember. I suddenly realised that Pierre was just behind our group. He sat down on the edge of the fountain with one of the technicians and posed for a photo at Darcy’s request. Another Friendship Group member, Pat and her daughter then joined our group for a few minutes before we all headed back to our seats. Right on the dot of 7pm, André followed by Johann and the JSO entered the stadium to the strains of ‘76 Trombones’. At first I thought tonight’s audience was a little more subdued than last night’s, with André having to prompt a response on a couple of occasions in the earlier part of the concert but, once they let their hair down, the audience joined in with gusto. As André introduced ‘’The Blue Danube’ with the faces of some members of the orchestra morphed into the blue waters of the Danube, people flocked out to the ‘mosh pit’ and aisles to dance. One lady at the northern end was waltzing enthusiastically by herself when an elderly gentleman raced down the stairs from the grandstand and scooped her into his arms, to the cheers and clapping of those watching in the audience. The arrival of Empress Sissi in the horse-drawn carriage drew gasps of wonder from the audience. A uniformed footman followed the carriage at a distance pushing a wheelbarrow. Maybe he has roses in his home garden! The Platin Tenors drew a standing ovation after their segment in the first half in honour of the late Pavarotti. Once again, Mirusia playing to her hometown audience also received a standing ovation amid thunderous applause. Marcel Falize’s rendition of ‘Bolero’ was perfection as usual. The on-screen explosions and the smoke drifting across the stadium was impressive. Tonight’s conga line, growing as it snaked along in front of the stage, included a couple wearing Tyrolean costume. The Australian segment during the encores attracted the most enthusiastic audience participation. Everyone stood while singing ‘Advance Australia Fair’ although the audience faded out during the second verse only to return for the chorus. There were tail-less kangaroos in the audience hopping up and down during ‘Tie Me Kangaroo Sport’. As well, the audience joined with gusto in singing ‘Home Among the Gum Trees’, the theme from ‘Neighbours’ and ‘Bananas in Pyjamas’. Even Darcy joined in clapping in time to the latter. December 4, 2008 AS soprano Mirusia floated over Suncorp Stadium on Wednesday night, the capacity audience at André Rieu's first Brisbane concert rose to give her a standing ovation. Wearing angel wings, Mirusia floated above the orchestra as her entrée to the show, before putting on a sparkling red dress to shine with her popular version of Wishing You Were Here Again from Phantom of the Opera. First standing was her father Jack Louwerse of Birkdale who joined the 30,000 audience as one of her biggest fans. "I felt very emotional to see her perform in her home town. Mirusia can sing all over the world, but singing in Brisbane is very special to her. You could see it in her face - so much love. It touched your heart," her mother Henriette said. As part of Mirusia's introduction, Andre talked of receiving dozens of emails from singers and musicians wanting to be part of his ensemble, but being completely captivated when a similar request came to hear Mirusia sing. Mirusia joined 250 artists on stage, amongst them debutant dancers, ice skaters and members of the Vienna State Opera and Imperial Ballet. She was paired with one other Australian performer tenor Gary Bennett from Toowoomba. The lavish and spectacular show was staged the length of the stadium in a reproduced castle, flanked by fountains and ice skating rinks. Features included the arrival of a horse drawn carriage and the Australian Pipe Band performing Scotland the Brave. The program included plenty of Strauss which had the audience waltzing in the aisles, Bolero and White Horse Inn extracts. Mirusia performed Botany Bay igniting the audience with the oorali-addities. More Australian songs formed part of the encore which lasted almost as long as the second half. André returns to Australia in October next year with tickets on sale from December 8. An hour-long electrical storm over Suncorp Stadium last night only added to the drama of middle-aged heart-throb Andre Rieu's first Brisbane concert. The crowd of about 20,000 mostly over 50s fans clapped, waltzed and sang well into the night alongside the populist Dutch maestro in the most unusual display of unbridled enthusiasm by a classical music audience. Among them, a handful of fervent Rieu groupies, including one woman wearing a t-shirt inviting her idol to "Come fiddle with moi". Rieu himself was in fine form, charming the crowd with pantomime gags, flirtatious winks and a heaped plate of orchestral pop hits from the music sheets of Puccini, Ravel and his orchestra's namesake, Johann Strauss. A tribute to the late Luciano Pavarotti by Rieu's own trio of tenors had the crowd in raptures early, while ice skaters in ballgowns, twirling debutantes and a singing "angel" suspended from the ceiling of the faux Viennese castle kept the spectacles coming. But it was 23 year old Brisbane soprano and Rieu's tourmate Mirusia Louwerse who stole the spotlight and the lion's share of applause with a soaring rendition of Andrew Lloyd Webber's "Wishing You Were Somehow Here Again" from his Phantom of the Opera. Decked out in a floor-length red sequinned number, she looked and sounded every inch the diva before leading the audience in a chant of "Aussie, Aussie, Aussie, oi, oi, oi" - fitting, given the sporting backdrop. She returned for an operatic take on "Botany Bay", a folk number, Rieu confided to his adoring fans, that had moved him to tears the first time his young protege let rip with it. The theme continued in a marathon 30-minute encore including "Waltzing Matilda", the Neighbours theme tune and the national anthem, which caught some out on the stage's four giant television screens when Rieu launched into the lesser-known second verse. The elaborate performance, complete with a full ballet company, bagpipers, chandelier-lit ballroom and even a gold, horse-drawn carriage to ferry a mock princess in and out of the stadium, will return tonight. A Spectacular Storm Failed To Upstage André Rieu! Sydney Morning Herald Fans at the Brisbane André Rieu concert were forced to take refuge inside Suncorp Stadium after a severe thunderstorm lashed south east Queensland and delayed proceedings by one hour. Organisers say they were very close to cancelling the concert as an 8pm starting time meant the concert could go as late as 11.15pm. One fan at the event said it was extremely crowded inside the corridors during the storm with people packed shoulder to shoulder. Damaging winds, large hailstones and severe lightning across south east Queensland forced Rieu fans standing on the grass and sitting in uncovered sections to take refuge inside the stadium, which was one of the worst areas hit by the storm. The concert, which was scheduled to start at 7pm, did not start until 8pm. André Rieu The Flying Dutchman Is Ready To Soar! The Flying Dutchman Is Ready To Soar! They are fanatical, determined and will gather by the thousand tonight for a chance to glimpse their idol in full glare at Brisbane's Suncorp Stadium. And a sneak peek at Dutch superstar violinist Andre Rieu's world tour spectacular suggests they won't leave disappointed.The final touches are being added to the mass production ahead of the first of two concerts tonight, when 50,000 people will pack the stadium at Milton. Despite the stifling heat in the city today, a touch of wintertime Austria will be unveiled with the fabulous Castle of Schonbrunn dominating the stadium's floor alongside two ice skating rinks and two working fountains. Hundreds of musicians, dancers and artists dressed in period costume will attempt to recreate the grandeur of the Viennese opera across the massive and detailed stage. All the pomp and ceremony will compete on stage with the renowned skills of Rieu, who, along with his Johann Strauss Orchestra and choir, will lead a revival of classical music including pieces such as the Blue Danube waltz. Rieu has played the violin since age five and began his career as a major concert performer in the late 1980s with a tour of Germany and the Benelux countries. The Brisbane concert has been more than a year in the planning. "Arguably I think it is the biggest stage the world has ever seen let along Suncorp Stadium, it is the biggest stage ever," Suncorp Suncorp Stadium General Manager Paul Sergeant said. Two thousand stadium staff are working on the production, alongside 500 performers and Rieu's own staff. The concert kicks off at 7pm tonight and again tomorrow night. "Hello to all my fans on The Harmony Parlor!" May You Have The Bestest Day Ever BJ!!! Merry Christmas From John and Sue! 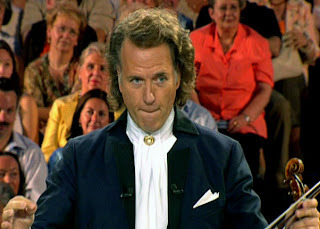 Marjorie Rieu "Woman in The Mirror"
André Rieu: When my wife drags me off the stage, I will stop!! Interview With André Rieu and Wife Marjorie on "De klassieken"
Mirusia’s Wedding: Rieu provides his "angel" with a groom. ► The Parlor On Facebook! ►Click To See Full Size Pic! ► André Rieu Fans "Done"
►Maastricht 2008 With ALL FANS Photos Combined! ♦A High Five From André! ♦André Snatching Flag From Fan! ♦Link To Reading Concert Review!